This time of year, I post a lot about Christmas celebrations and fun. But for some people, the season brings more sorrow than joy. That’s especially true if you’ve suffered a recent loss or are dealing with a difficult situation. St. Mark’s Episcopal Church is reaching out again to those in the community who need solace this season. 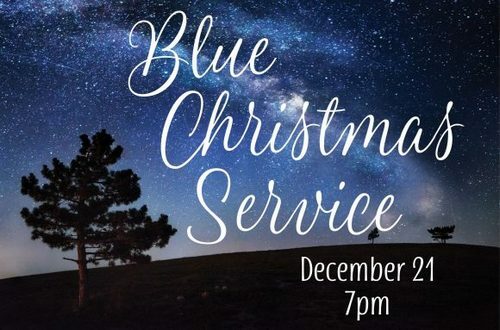 Join St. Mark’s Church on Thursday, December 21 at 7pm for a community wide “Blue Christmas” service that focuses on the coming of Emmanuel into our world. Not everyone is up and cheery for the Christmas holidays. Dealing with the death of a loved one, facing life after divorce or separation, coping with the loss of a job, living with cancer or some other disease may make the Christmas holidays difficult for some people in our congregation or community. This quiet service of prayers, readings and candles allows a chance to find solace as we enter the Twelve Days of Christmas. Open to all.